1) What are winter tyres? they generally have deeper tread grooves than a conventional summer tyre. 2) What are winter tyres good at? They are good at gripping cold, damp roads, below about 7C. The key to their improved grip on wet and ice-covered surfaces is the sipes, which provide hundreds of small extra ‘edges’ to grip the road as the tyre rotates. The sipes help, not only because of their edges, but because they enable localised movement of the rubber as the soft compound clings to the road. A larger single, solid tread block, like the ones you see on summer tyres, would stay rigid in such conditions and be unable to maintain grip as effectively. Winter tyres are also designed to gather a snowy 'in-fill' in the tread grooves and in the sipe slits, to help with grip on loose snow. Think about how you create a snowman by rolling a snowball, bigger and bigger, and hopefully it will help you understand that snow clings to snow, so a covering of snow on the tyre actually aids grip. The extra deep tread grooves also help the tyres to disperse surface water and usually increase resistance to aquaplaning. 3) What are winter tyres bad at? At temperatures above 7C they offer significantly poorer grip in dry conditions than the best summer tyres. This can mean a marked increase in braking distances and poorer handling and grip in bends. 4) Are they just for snow and ice? No. They are designed for use in all winter conditions – with the tyre manufacturers claiming this means all conditions below 7C. 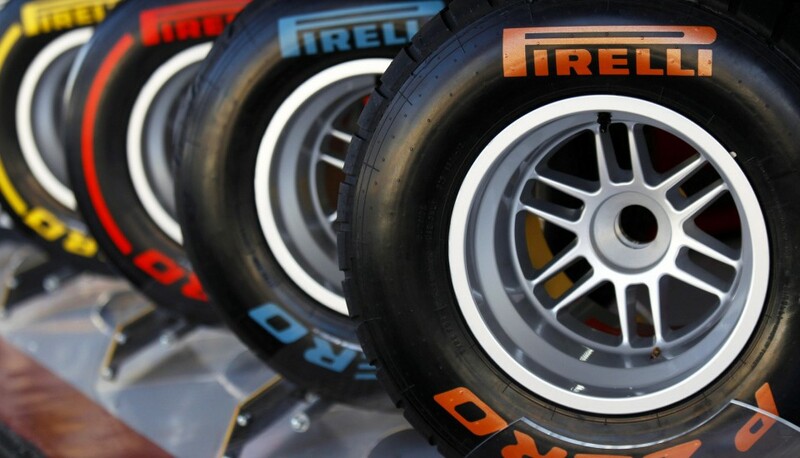 5)What do I do with my winter tyres during the summer months? For a small fee, we will changeover your winter tyres back to summer tyres once the freezing weather has passed and store them for you until next winter. Alternatively we can supply a winter wheel & tyre package. Call us for further information. 6) Do I need winter tyres in the UK? Winter tyres aren’t mandatory in this country, although they are in other parts of Europe that experience extreme weather for prolonged periods, each and every winter. Below shows the average UK winter temperature. 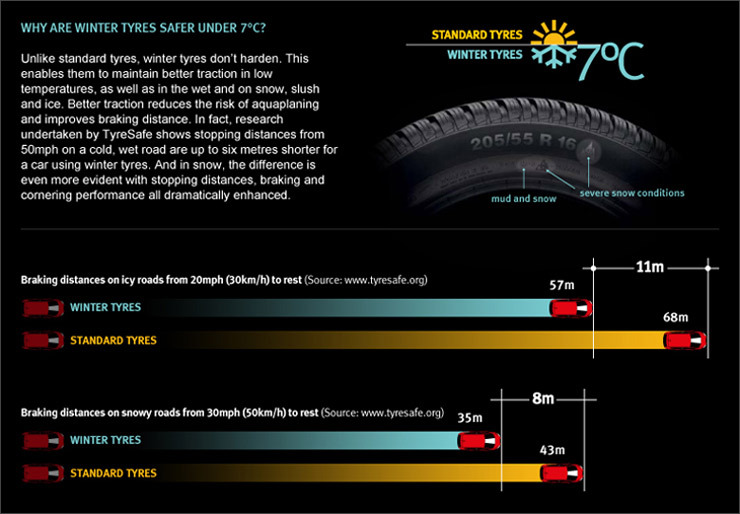 The last two winters have seen three exceptionally cold spells (by UK standards), when there is no doubt, winter tyres may have been beneficial to many people. We completely understand why some people, especially those living in remote areas, are preparing their cars for winter by fitting winter tyres. It makes good sense if there’s another bad winter and you don’t fancy being cut-off. If that sounds like your situation, then try to buy the best winter tyres early in the season, for two reasons. First, it's no good waiting until the bad weather arrives, as you'll find you are unable to get to a tyre retailer to have them fitted. Second, the volume of tyres produced for the winter is limited, meaning retailers don’t have a never-ending supply. When they are gone, they are gone and there won't be more stocks until the run-up to next winter. 7) When should I fit winter tyres? They need to be fitted before bad weather strikes. Waiting until the roads are frozen and the car is under a snow drift will mean you’re unlikely to be able to fit them. In the European countries where the use of winter tyres is mandatory in cold conditions, most people have them fitted around October and then removed (and replaced with summer tyres) around March. In the UK, fit them before the bad weather sets in, then remove them in spring when you are confident the last of the cold conditions have passed.